Oh wow were these a hit! Both of my sons and Keith loved these delicious pancakes! Stir/whisk all the dry ingredients in a bowl (flour, sugar, baking powder, cinnamon, and salt). In a separate bowl stir/whisk the milk, banana, melted butter, and eggs. Gently pour the wet bowl into the dry, and stir JUST until there’s no obvious chunks of flour. 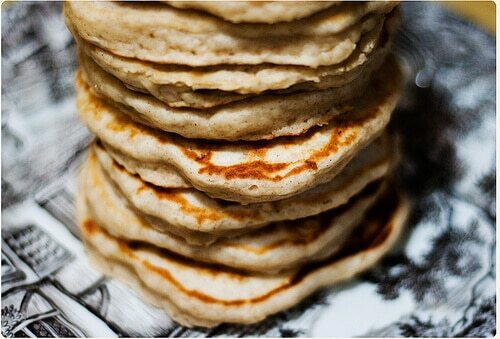 You want lumps, lumps equal pancake perfection. Grease a skillet or griddle (I used butter yum) and heat over medium heat (approx 300 degrees on a griddle): pour in 1/4 cup batter for each pancake. Cook the pancakes about 3-4 minutes per side, I use a timer. You want these to be golden brown, not pale or burnt. I topped with butter, Keith put peanut butter on some of his, Tristan preferred to just cram them in his mouth (baby led eating at its finest lol), and Daniel liked maple syrup (the real stuff of course!). Try these out and let me know how you enjoy them! Thank you! Oh yes, I was a bit surprised at how much everyone tore through them lol. Pancakes are the bane of my cooking experience. I’ve tried making them three times and always seem to fail in someway! I will have to try this recipe sometime though. I like banana flavor, but the texture can be a bit gross to me sometimes (idk why) so this is good that that too. (: Cute baby! How do your pancakes turn out? Too pale, too dark, not fluffy? Aww thank you, he is the uber squish! I burn them, they end up chewy or soggy, not fluffy. Various forms of bad. Sounds like the heat is just too high, they need to be cooked slowly, try a low-medium heat next time! I’ve never really been a fan of flavored pancakes but I may try this one out some time. I know my hubby like nanner pancakes. The flavor is really close to banana bread which is a HUGE favorite around here! I’ll definitely be trying these out sometime! I’m a huge fan of your pumpkin pancakes, so these have got to be just as good! Aww yay! They are seriously very tasty! I made something similar when I worked at the daycare, except it included rolled oats. Quite tasty even though I’m not one for pancakes. An oatcake would be interesting for sure! Why you not a fan of pancakes? Wow! Looks delicious! I just might have to try this! 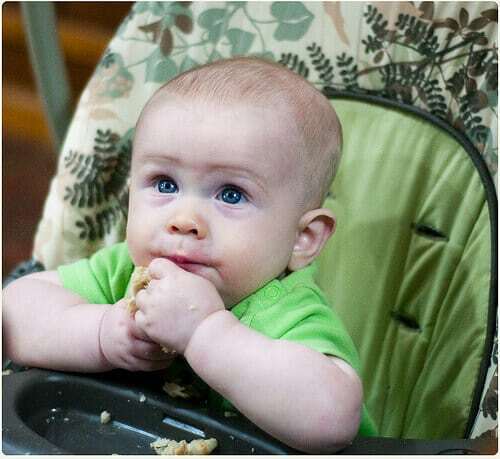 I’ve got a TON of banana babyfood, I could easily substitute that in, couldn’t i? I’ve never used/been familiar with baby food but sure it should work since you want a smoother consistency to the banana mash mixture! Popped in from SITS to say hi! Those pancakes look so good! Hi! Thank you so much! Those look and sound sooooooo delicious! YUM! Thank you! They really are super tasty! Hey! Couldn’t help but notice the similarity in our names! These look good! I’ll definitely have to try them, both me and hubby love pancakes! Thank you so much! I love pancakes because they store well too, even though we never have any leftover lol. I LOVE banana pancakes!!! Now…how to get the hubby to make this for me and bring it to me in bed…Think…Think. When I saw this latest post on your SITS comment I had to come snd invesigate! Thank you so much! I always find it hard to post recipes because I HAVE to have a photo (or 20 lol) to accompany the post and since I am picky about photography… you can see where it takes more mental thought process for me than you know, a NORMAL human to blog a simple recipe LOL! Those pancakes look really good. Thank you for sharing. Sarah, you always have such great recipes. 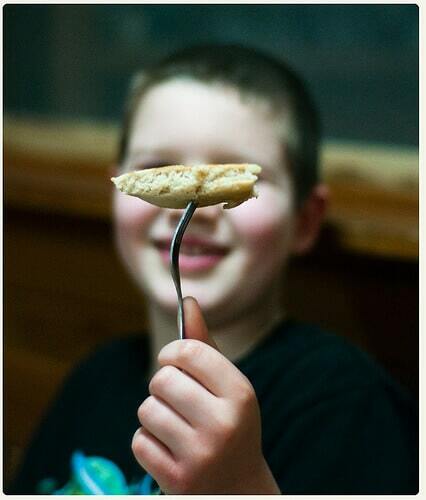 Those pancakes look fabulous and the boys appear to have enjoyed them very much. :) Can’t wait to give them a try myself! Aww thank you. Oh yes, they LOVED them. I may have to make a double batch next time just to create leftovers! Ok, those look delicious. 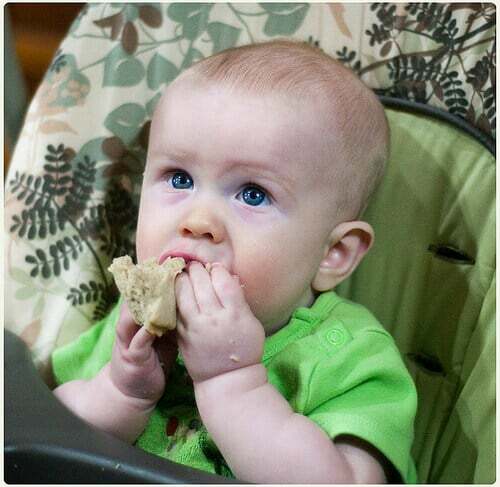 I especially like Tristan’s approach to eating. LOL right! It’s basically a cram it all in approach! These look so yummy! You should totally link this up at my Vegetarian Foodie Fridays linky. It was from yesterday but I’m not posting again til Monday. It would be a great addition. I linked it up! Awesome linky you created! I will have to participate in it more often! 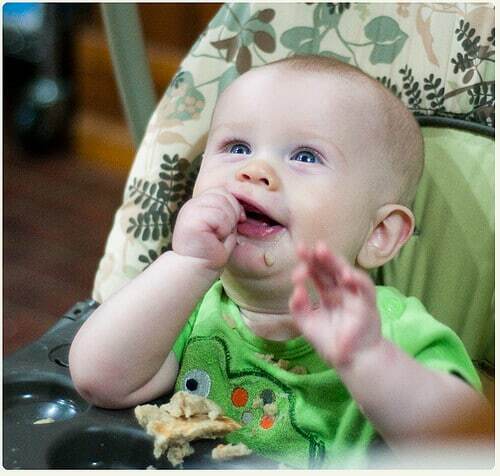 While the photos of the pancakes look delish, the photos of the kids are my favorite! So cute. Aww thank you! I feel like I am always fighting for either happy squishy baby photos where he isn’t lunging for the camera or photos of my oldest where he isn’t suddenly a power ranger or battle droid lol. Oh my that looks yummy delicious. Love the pictures too! love your blog design too, it’s gorgeous! Oh what a fabulous idea! I have frozen blueberries still from LAST year’s farmers market. Banana blueberry pancakes could be very tasty! My hubby makes the pancakes in our house, but I’m tempted to give these a whirl. All I seem to be reading is food blogs and recipes this morning! Your baby is edible, by the way. This is a great way to add some fruit to my little ones diet. I will have to try it out. It really is! Especially bananas which I believe are high in potassium! Just wanted to let you know I got my hubby to make this for me yesterday. They were fantastic. My kids seemed to love them to. Thanks for sharing this recipe! We make these at our home too. They really are delicious. Visiting from SITS. Oh yes, the best thing about pancakes in generally is you can put ANYTHING in them really! OMG I LOVE pumpkin pancakes lol. I even posted a recipe for moist and fluffy pumpkin pancakes! ooh thanks for the recipe, gonna have to try that out! I LOVE banana pancakes. Have been eating them since I was a wee one. 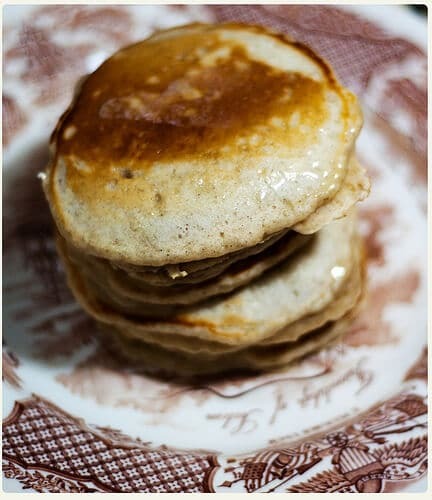 Your recipe sounds yummy – I’ve never added cinnamon to mine, though I have made cinnamon pancakes! Visiting from SITS – Happy Day!